This particular factoid really doesn’t seem like something they needed to include. Wow. 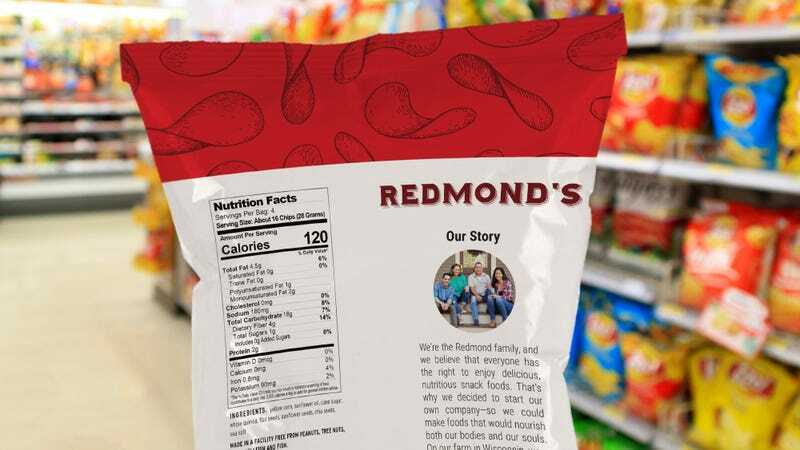 It’s not clear why the Redmonds thought it was a good idea to publicize that story at all, let alone right on their product’s packaging. After spending a few additional sentences talking about how their youngest daughter still wakes up screaming from nightmares about the man they hit with their minivan, the Redmonds conclude the “Our Story” section with a pretty cute picture of their dog, who they jokingly call their “Vice President Of Taste Testing.” Honestly, it probably would have been better if they had just focused exclusively on the dog element and left out the hit-and-run entirely. Yep, this was most likely not the right move on the Redmonds’ part. They could have pretty much just mentioned their names, let their customers know that their chips are always baked and never fried, and just entirely left out the story of when they accidentally killed someone. It seems like their company is still doing all right and getting stocked in some major grocery stores, so all isn’t lost, but they might want to hire an editor when they’re working on the copy for their next snack food’s packaging.